Our third, Austin, TX based, Hot Freaks! event is happening Friday March 14th, and Saturday March 15th, noon – 6pm. Two days of, AD approved, live music, on three stages, held at Club DeVille and the Mohawk, located next to one another on Red River street. Once again the parties are free to the public. 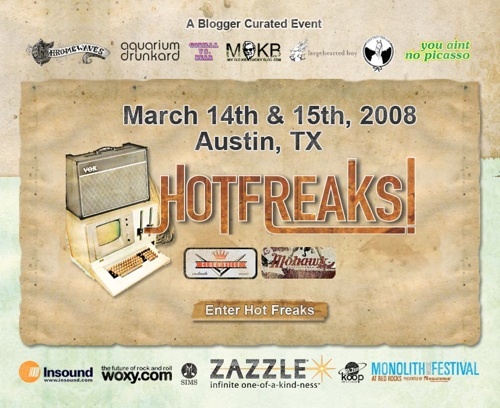 Posted on February 21, 2008 February 21, 2008 Hot Freaks! RSVP? First come first serve? nice. i think i can identify a few of your picks…..